Pagel, David. “What do these books on a shelf say about their owner? And what does your answer say about you?” (Art Review). Los Angeles Times. February 23, 2109. Finkel, Jori, “Frieze Los Angeles: Lights, Camera, Art!” New York Times, February 13, 2019. Zara, Janelle. 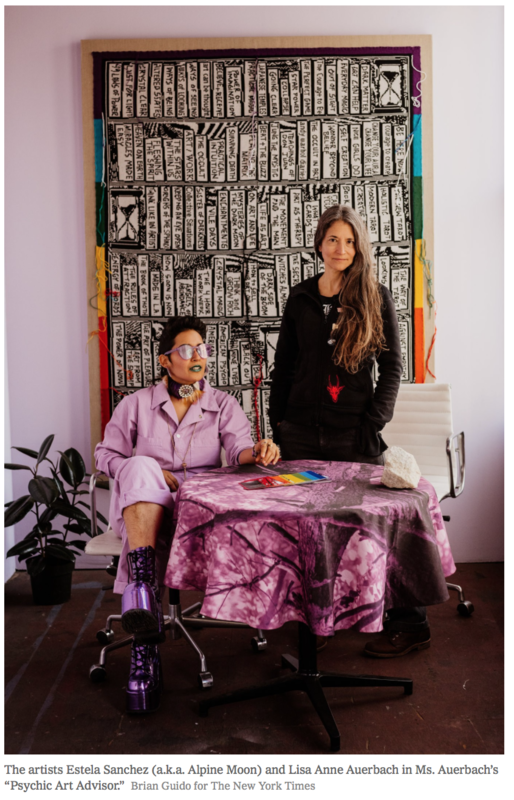 “It’s All in the Cards: Lisa Anne Auerbach Offers Psychic Advisory at Frieze Los Angeles.” ArtNews, Feburary 15, 2019. Cascone, Sarah. “What Art Should You Buy at Frieze LA? A Psychic Art Advisor Is on Hand to Help Solve All Your Creative Conundrums.” Artnet, February 15, 2019. Interview with Bettina Korek, LALA Magazine, Winter 2019. Higgs, Matthew, “The Meow, Los Angeles”, Artforum, Year-End Top 10, December 2017. Vankin, Deborah. “Beverly Center as art gallery? How some big-name artists are behind those construction barricades." Los Angeles Times. April 20, 2017. Little, Anita. “The Higher the Dome, The Closer to God: “Megachurches” Explores the Arid Architecture of America’s New Sanctuaries.” Religion Dispatches. September 2, 2016. Moroz, Sarah. "Megachurches: photographing America's drab new cathedrals." The Guardian. Sunday, May 1, 2016. Williams, Maxwell. "Sweater Weather: Lisa Anne Auerbach's Political Textiles." KCET Artbound, January 29, 2016. Thompson, Michael. "The 2014 Whitney Biennial: the Book as a Medium in Contemporary American Art." The Papers of the Bibliographical Society of America. Volume 109:2. June, 2015. Pp. 147-192. Print. Rus, Mayer. "Common Cause." Architectural Digest. May 14, 2015. Beato, Greg. “So Print is Dying? Don’t Tell the Megazine.” New York Times. March 19, 2015. P. f32. Print. Tumlir, Jan. Exhibition review. Artforum Magazine. January, 2015. Print. Berardini, Andrew. Exhibition review. Art Review Magazine, December, 2014. Print. Abrahams, Megan. “Lisa Anne Auerbach at Gavlak Gallery,” White Hot Magazine, November, 2014. Keefe, Alexander. “Critic’s Pick,” Artforum Online. Melrod, George. “Artist Profile: Lisa Anne Auerbach.” art ltd. Magazine, September, 2014. Print. Lucas, Maxwell. “Lisa Anne Auerbach’s Solitary Spells at Gavlak Gallery.” Exhibition review, Whitewall, September 25, 2014. Martinez, Christina Catherine. “Nothing is Set in Stone.” Exhibition review, Artslant, September 23, 2014. Mizota, Sharon. “Lisa Anne Auerbach’s Barbed and Cozy Knits at Gavlak Gallery.” Exhibition review, Los Angeles Times, September 25, 2014. Miranda, Carolina. “Message in a Sweater: Lisa Anne Auerbach on cats, knitting and zines.” Los Angeles Times, September 9, 2014. Frank, Priscilla. “The Space where Zines and Sweaters Overlap.” Huffington Post, September 2, 2014. Luke, Ben. “Abstract America Today, Saatchi Gallery." Exhibition review. London Evening Standard, May 28, 2014. Morris, Bill. "The Writing on the Wall (Redux): The 2014 Whitney Biennial, Starring David Foster Wallace.” The Millions. March 13, 2013. Defore, John. “Whitney 2014 Biennial: Five Hot Artists to Watch.” HollywoodReporter.com. March 7, 2014. Sjostrom, Jan. “Art Exhibit a Creative Reunion.” Palm Beach Daily News (The Shiny Sheet). February 28, 2014. p. 1. Skoglund, Sara. “Lisa Anne Auerbach.” Artlover #14, 2013. Pp. 23-24. Engström, Frida Arnqvist. “Bäraren är Budskapet” (The Carrier is the Message). Konstperspectiv, January 2013. Pp 36-39. Monachesi, Juliana. “Costuras Contemporaneas.” Harper’s Bazaar Brazil. February, 2013. Pp. 148-151. Von Borries, Friedrich. “Mach Es Nicht Selbst” (Make it Uneven). Monopol. February, 2013. P. 21. Diedrichs, Maria. “Med Maskorna Som Vapen” (With Stitches as Weapons). Hemslöjd, Number 1, 2013. pp. 33-37. Berardini, Andrew. “Chicken Strikken (book review).” The Art Book Review, January 28, 2013. Duncan, Fiona. “Lisa Anne Auerbach on Her Subversive Sweaters & Why She’s Sitting Out the Election.” Bullett. October 25, 2012. Berardini, Andrew. “Take This Personally: Lisa Anne Auerbach. “ Art Slant, November 28, 2012. Themsen, Maria Kjaer. “Ti spørgsmål: Lisa Anne Auerbach.“ Kunstkritikk, November 9, 2012. Frank, Priscilla. “Lisa Anne Auerbach's Politically Charged Knitted Sweaters Rock Our World.” Huffington Post, November 6, 2012. Wright, Chris. “Pies Christmas Gift Idea 2012: #1 The Zlatan Sweater.” Who Ate All the Pies Soccer website, November 27, 2012. Galperina, Marina. “Lisa Anne Auerbach’s Awesome, Arty Feminist Sweaters.” Flavorwire, October 17, 2012. Söderholm, Carolina. “Laddade tröjor matchar rummet Konst (Charged Shirts Match Room Art” Sydsvenskan, November 14, 2012, p B4. Dambrot, Shana Nys. “Lisa Anne Auerbach: The Social Knitwork.” L.A. Canvas, Volume 1, Number 6. September/October 2011. p. 18-19. Hodge, Brooke, “Seeing Things | Studio Visit: Lisa Anne Auerbach.” New York Times Design Blog (June 23, 2011). Jortveit, Anne Karin. “Handmade Actions.” Norwegian Crafts (March 11, 2011). Green, Penelope. “Is it Art or Their Shoes?” The New York Times (December 10, 2009), Section D, Page 1. Vogel, Carol. “Wish You Were Here.” The New York Times (March 19, 2009): Section F, Page 1. Recker, Keith. “Shout it Out.” Hand/Eye Magazine (2009): 2. Patterson, Mark. “Some Purls in a Show of Knit Wit.” Nottingham Evening Post (October 9, 2009). Matthews, Riah. “Artist Inspired By Robin Hood For Exhibition.” Nottingham Evening Post, (October 3, 2009). Goldwyn, Liz. “Lisa Anne Auerbach.” Hanatsubaki (August, 2009): 27. Wiley, Chris. “The Office.” Abitare (June, 2009): 165-167. Maloney, Patricia. “500 Words.” Artforum.com (September 30, 2009). Rizzotti, Alessandra. “Heeb 100.” Heeb Magazine (October, 2009). Graubart, Hadara. “Sweater Girl.” Tablet Magazine Online (July 23, 2009). Stryker, Mark. “Artists and Their Art: Lisa Anne Auerbach.” Detroit Free Press (July 5, 2009). Ward, Alie. “Bike Night at the Hammer Museum.” Los Angeles Times. Byron, Jacquie. “Knit... With Grit: Politics and the Knitting Needle.” Get Creative, Australia (May 2009). Pp 12- 17. Zohn, Patricia. “Culture Zohn: Lisa Anne Auerbach and Jenny Holtzer: Art Meets Politics Over Words.” Huffington Post (March 13, 2009). Cave, Damien. “Laugh at a Campaign Pitch? Sure. Visit the Grandparents? Not so Much.” The New York Times (October 14, 2008): Section A, Page 12. Kongsbak, Kirja. “Strik Kan Gøre en Forskel.” GavStrik (Winter, 2008): 4-5. Fuller, Daniel. “Comics of Salvation.” Art On Paper (November/December, 2008): 14-16. Solberg, Tone. “Politikk og strikk.” Aftenposten (November 28, 2008): 40-44. Gersten, Lana. “Political Stitch: Knitting for Obama.” The Forward (October 16, 2008): 2. Williamson, Damien. “AAM Hosts a Different Kind of Voting Drive.” Aspen Daily News (October 9, 2008): 6. Oksenhorn, Stewart. “Poli-Knits: Lisa Auerbach fashions a message in sweaters.” Aspen Times (October 4, 2008): 27-28. Plimack, Alex. “Artists Taking Care of Business.” Baltimore Sun (May 31, 2008). Cervasio, Stella. “Accademia Belle Arti in scena la ‘disturbata.’” La Republica (May 21, 2008). Pepe, Anita. “Va in scena la realta quoidiana.” Roma (May 21, 2008). De Stefano, Stefano. “Anche la scenata finisce in mostra.” Corriere Della Sera (May 21, 2008): 21. Baltimore's Creative Stock Is Mostly on the Rise in 'Cottage Industry.’” Washington Post (July 13, 2008): MO4. Berardini, Andrew. “Lisa Anne Auerbach: Auerbachtoberfest.” Art Review (January, 2008). Cotter, Holland. “Go Ahead, Expect Surprises.” New York Times (August 9, 2007). Leaver, Jon. “The L.A. County Fair: Paradise Lost, Lost, or Nostalgia Ain’t What it Used to Be.” X-TRA (Spring 2007). Polgreen, Erin. “Art Space: Body Count Mittens Project.” In These Times (April, 2007): 41. Warren, Ellen. “Making Trouble.” Chicago Tribune Magazine (April 1, 2007): 15. Witchel, Leigh. “Extreme Knitting.” Knit.1 Magazine (Spring, 2007). Percival, Lindy. “Make it Yourself: The Critical Guide.” The Age, Australia (December 22, 2007): A2, Page 5. Schwendener, Martha. “Flair and Flash, Not Frumpiness.” The New York Times (January 27, 2007): Section B, Page 9. Harvey, Doug. “StreetSignism.” LA Weekly (November 17-29): 2006. Epstein, Rebecca. “For Your Social Consideration.” Citybeat (December 7-13, 2006). Neil, Jonathan T.D. “Interstate: The American Road Trip.” Art Review (August 2006). Pagel, David. “A passionate red-state manifesto.” Los Angeles Times (July 7, 2006). Holte, Michael Ned. “Preview: From California To the New York Island.” Artforum (Summer, 2006). Summers, Marya. “Art Review.” New Times West Palm Beach (April 20, 2006). Gschwandtner, Sabrina. “USA Knitting Today.” Rowan Magazine (Spring/Summer 2006). Bollen, Christopher. “Modern Art’s Three Hot Trends.” Domino (March, 2006). Mangan, Lucy. “Frieze: A walk on the wild side: Lucy Mangan joins the Interlopers, a bizarre artists’ hikng club, as they amble (in fancy dress) along the corridors of the art fair.” The Guardian (October 21, 2005): Page 11. Finkel, Jori, “Making the Desert Bloom Out West. Way Out West.” The New York Times (September 25, 2005): Section 2, page 36. Dambrot: Shana. “Lisa Anne Auerbach: Fear No Sweater.” FiberArts Magazine (Jan/Feb 2006). Armstrong, Liz. “The Crafty Protester.” Chicago Reader (October 22, 2004). Timberg, Scott. “Shimmers in the Desert.” LA Times (May 25, 2003). Lott, Jeremy. “Is the Pope cool? Divinely, and in more ways that one. National Post, Canada (July 20, 2002): Page B1. Bonetti, David. “Gallery Watch.” San Francisco Examiner (February 28, 1997). Berman, Tosh. “News: The Casual Observer.” Art Commotion (July 22, 1996). “Cheese instead of Asceticism,” Der Spiegel (May, 1996). Green, David A. “Photography Los Angeles? Not Now.” LA Reader (September 8, 1995). Greene, David A. “Blurred Visions.” LA Reader (October 28, 1994). Frank, Peter. “Two Exhibitions Differ Dramatically but Share Comparable Energy Levels.” Orange County Register (January 6, 1994). Morgan, Charles. “Gorgeous Politics.” Las Vegas Weekly (December 21, 1994). Curtis, Cathy. “Freeing Words From Their Life Sentence.” LA Times (February 22, 1994). Bryan-Wilson, Julia and Jacob Proctor, Lisa Anne Auerbach (exhibition catalogue). Ann Arbor: University of Michigan Museum of Art, 2010. Porter, Jenelle and Phaidon editors. Vitamin T: Threads and Textiles in Contemporary Art. Phaidon, 2019. Irmas, Deborah. This is Not a Selfie: Photographic Self-Portraits from the Audrey and Sydney Irmas Collection. Los Angeles County Museum of Art, 2017. Wasteland: New Art from Los Angeles. Edited by Alessandra Bellavita, Trinie Dalton, Samantha Frank, Matthieu Lelièvre, Shamim M. Momin. Paris: Galerie Thaddaeus Ropac, 2016. Paris Photo 1997-2016 Parcours. Paris, Editions Xavier Barral, 2016. p328. Engström, Frida Arnqvist. Gerillaslöjd. Hemslöjden Förlag, 2014. Pp. 18-31. Tinkler, Mamie. “Empress of Modest Propaganda.” Whitney Biennial 2014. Whitney Museum of American Art, New York. 2013. Pp. 40-43. Ilfeld, Etan Jonathan. Beyond Contemporary Art. Vivays Publishing, 2012. Pp. 26-27. Sakamoto, Carla. For Which It Stands: Americana in Contemporary Art. New York: Farameh, 2012. Buszek, Maria Elena, ed. Extra/Ordinary: Craft and Contemporary Art. Duke University Press Books, 2011. Hemmings, Jessica, ed. The Textile Reader. London: Berg Publications, 2012. Philagrafika. The Graphic Unconscious (exhibition catalogue). Philadelphia: Philagrafika, 2011. Klanten, Robert, Matthias Hübner, Alain Bieber, Pedro Alonzo and Gregor Jansen, eds. Art & Agenda: Political Art and Activism. Gestalten, Berlin, 2011. Hughes, Steve. Stupor: A Treasury of True Stories. Stupor House, 2011. Smith Magazine, ed. More Six-Word Memoirs: By Writers Famous & Obscure. New York: Harper Perennial, 2011. Earle, David P., The Open Daybook. New York: Mark Batty Publisher, 2010. Fogle, Douglas et al, Creamier: Contemporary Art in Culture: 10 Curators, 100 Contemporary Artists, 10 Sources. London: Phaidon, 2010. Tapper, Joan and Gale Zucker, Craft Activism. PotterCraft, 2011. Sundbø, Annemor, Knitting in Art. Norway: Torridal Tweed, 2010. Aarons, Philip and Andrew Roth, editors, In Numbers: Serial Publications by Artists Since 1955. New York: PPP Editions and Andrew Roth Inc, 2009. Jackson, Suzyn. Knit It Together. Voyageur Press, 2009. Pp. 52-55. Subotnick, Ali. Nine Lives: Visionary Artists from L.A. Los Angeles: Hammer Museum, 2009. Turney, Joanne. The Culture of Knitting. Oxford: Berg Publishers, 2009. Plested, Lee. Common Threads. Alberta: Confederation Centre Art Gallery and Illingworth Kerr Gallery, Alberta College of Art and Design, 2008. Wills, Kerry. The Close-Knit Circle: American Knitters Today. Connecticut: Praeger Publishers, 2007. 72. Chambers, Kristin. Cottage Industry. Baltimore: The Contemporary Museum, 2008. 28-35. Searle, Karen. Knitting Art. Minneapolis: Voyageur Press, 2008. 104-111. Sabrina Gschwandtner. KnitKnit: Profiles and Projects from Knitting’s New Wave. New York: Stewart, Tabori & Chang, 2007. Antebi, Nicole, Colin Dickey, and Robby Herbst. Failure! Experiments in Aesthetic and Social Practices. Los Angeles: Journal of Aesthetics and Protest, 2007. Tatsos, Irene. Fair Exchange. Pomona: Millard Sheets Gallery, 2006.